"This lonely kitten reminds me of a beautiful and old wooden house that was inhabited. For some reasons, I always think about that house when I see an abandoned kitten," says Pimon Singhasin. 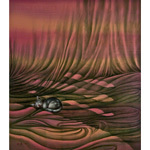 The artist paints the cute feline with acrylics on imitation silk. Materials: Acrylic on imitation silk (cotton and polyester mix).